Is a private company registered under the Ontario Business Corporations Act and is wholly owned by the Corporation of the City of Sault Ste. Marie. PUC Inc. has one subsidiary: PUC Distribution Inc. Distributes electricity to residences and businesses within the boundaries of the City of Sault Ste. Marie as well as parts of Prince Township, Dennis Township and the Rankin Reserve. PUC Distribution Inc. is a provincially regulated Local Distribution Company (LDC) and must comply with requirements issued by the Ontario Energy Board (OEB) with respect to provision of services. As a participant in the Ontario electricity market, PUC Distribution Inc. must comply with the rules of the Independent Electricity System Operator (IESO). As an LDC, the company must adhere to Regulation 22/04 of the Electricity Act. Is a utility services company operating as a wholly owned private company of the Corporation of the City of Sault Ste. Marie and is incorporated under the Ontario Business Corporations Act. PUC Services Inc. manages the assets and business of PUC Distribution Inc., manages the city’s water treatment and distribution system and operates the City’s two wastewater treatment plants under multi-year contracts. PUC Services Inc. also provides billing and customer care services and manages the operations of Espanola Regional Hydro under multi-year contracts. Water and wastewater services are also provided to several communities and organizations in the Algoma District. 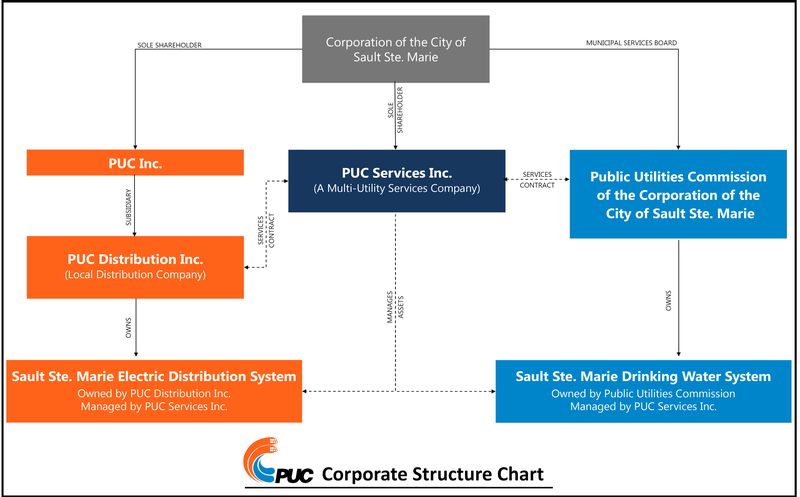 The Public Utilities Commission of the City of Sault Ste. Marie owns the water supply and distribution infrastructure and is responsible for the provision of safe, reliable, potable water at cost to customers within the municipal services boundary of Sault Ste. Marie, Ontario. Potable water is also supplied to an area of the Rankin Reserve of the Batchewana First Nation through the same distribution system. The management, maintenance and operations of the water treatment plant, wells and the approximately 470 km of watermains in the distribution system are carried out by PUC Services Inc. under a long term contract.